I’m happily adjusting to mommyhood and getting into a groove where I can make it into the Bramble Berry office a couple afternoons a week and work from home most mornings. 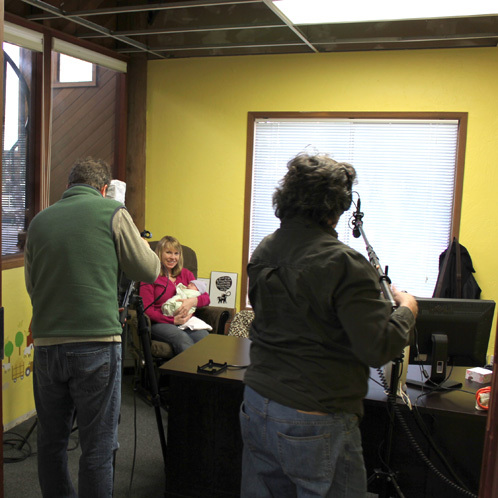 Tuesday, I popped in to do an MSN.com interview for Bramble Berry’s Small Business of the Year Award for Washington State. They wouldn’t tell me the exact air date but I’ll be sure to keep you all updated. 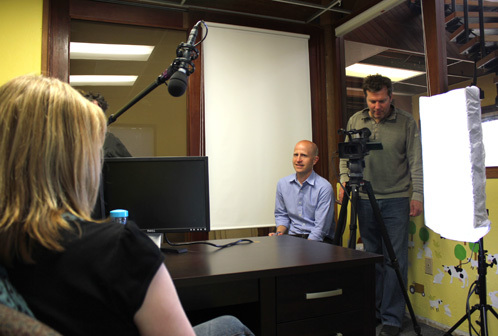 The film crew was awesome! Notice all the kid friendly decals on the wall? I’m hoping he doesn’t peel them off and eat them up! 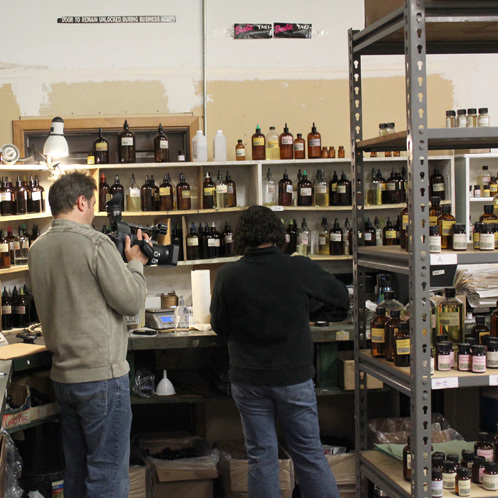 They filmed all throughout the warehouse too so hopefully that part will make it into the final cut. You may get your chance to see some of the Bramble Berry warehouse! Thank you to everyone that posted comments and suggestions to the eh hem, gassy baby issue. I am doing everything + a bit more: I’m off dairy, we’ve tried probiotics, no probiotics, no prenatal vitamins for Mom, prenatal vitamins for Mom, no soy for Mom, baby chiropractor appointments, two kinds of gripe water, 1 homeopathic treatment, chamomile tea for Mommy, chamomile tea (small amounts) for baby, fennel tea for Mommy (lots and lots of it! ), a million different burp baby positions, feeding him upright + more. Something is working or some combination of things is working because Lil Man is decidedly less gassy. Thank you for all of your helpful suggestions. I’m going to keep doing all of it and then some just to make sure that Jamisen stays as happy and healthy as possible. 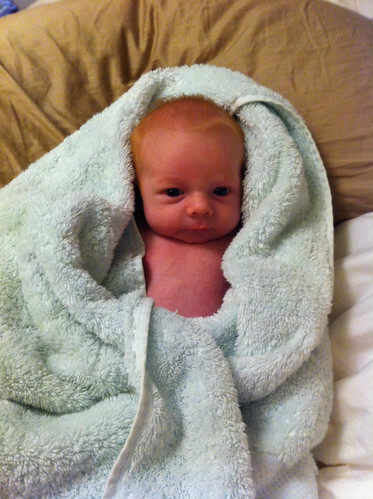 I will leave you with this photo of Jamisen after his first shower. He loved the warm water and so sooooo relaxed when it was all over. I missed seeing this when you first published it. Awesome! Can’t wait for the interview! I’m SO glad that Jamisen is doing better. That means you and your husband are doing better, too. He looks pretty cute and content after his shower. All the best! Anne-Marie if you are going off your prenatal vitamins be sure you are getting your 1000 mg/day of calcium. If you fall short on calcium Jamisen will get his but your body will pull it from your bones if your levels are low. And you know the result — your bones will be more fragile and susceptible to fractures and breaks. Jamisen is SUCH a CUTIE! So adorable! Congrats on him and beating the gas issue. My daughter was like that, too….oh what a time we had with her. I wouldn’t wish that on any parent! I echo someone’s comments above, they grow so fast. My oldest just went to his first Prom (he’s a Junior) and I still can’t believe he’s not a baby any more. I remember when he used to fall asleep in my arms. Enjoy it, it’s over way too fast! I agree with everyone’s comments! Congrats on the interview. Thanks for sharing the adorable photo. Time does fly so fast! It may be hard to believe right now, but blink and your son will be 16 years old. That’s how old my son is. I still remember the day, where and when I made my 3 month old son laugh for the first time. By the way, sorry to hear you won’t be coming to the conference next week. I was hoping to meet you. But you have the best excuse for not coming! He´s so cute!!! God bless Bramble Baby Jemisen. Wonderful photos of BB warehouse. I would like to be theeeeeere!!!!! Oh, too far…sniff! Oh Jamisen in a towel how darling and heart warming all in one! Thank you for sharing him with us! Congrats on the interview, your hard work and dedicated team wow so nice to see it recognized! Hope you will link the MSN interview when available. He’s got the cutest bright blonde hair!!! I’m glad he is feeling better. Jamisen is such a little cutie, and they grow up so fast. Seems like just yesterday my three boys were that little and now they are all in their mid-to-late 20’s with the oldest getting married next month. Congrats on winning the award. I can’t think of anyone who deserves it more!!! He is looking very blonde…don’t you love being a mommy! He is just a precious little angel. I am glad he is feeling better…Try to relax during the weeks after his birth…don’t return to work too fast…this is a very special time and you won’t get it again once you return to working…try to spend some time just resting and snuggling and let your helpers work for a bit for you…If you return too soon you will wear yourself out. Boy is he a cutie! Have fun new mommy! Oh my goodness – your baby is so super fantastic! What a complete doll. Ahhh, those are sweet, sweet, days – I know you are enjoying them! Love the peek into BB world – congrats on the interview and award! That is SO exciting, Anne-Marie! Totally cannot wait to see the MSN interview and so proud of you! Also sort of “stoked” to see the behind the scenes of the BB enterprise. I have always wondered; “do they hand pour everything, even the millions of 1 oz’ers?” Because I myself have ordered at least 100 of those myself! And yep, it looks like you do! Thanks for taking the time to provide entertainment, pictures, updates, and your friendship to all of us! 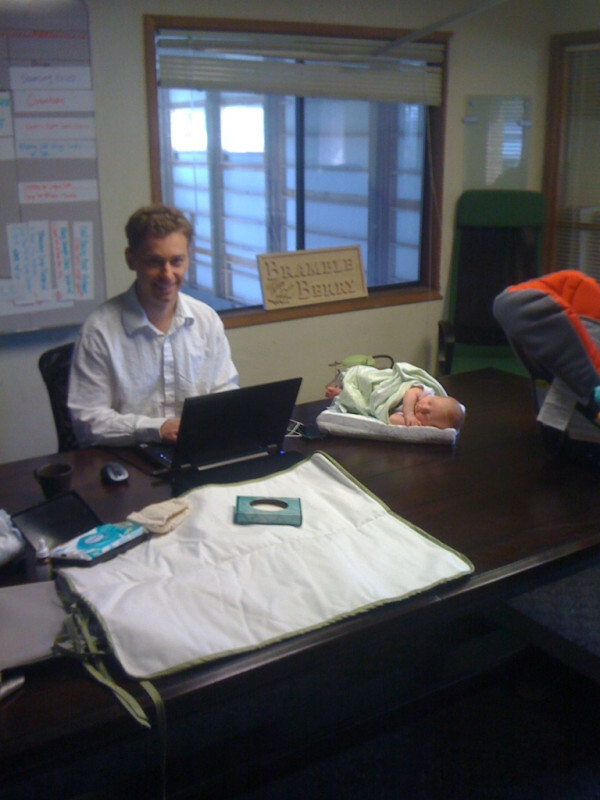 How fun to be at work with the baby and hubs for an interview?! Continued blessings Anne-Marie! He is such a beautiful baby! A lot of “things” may work to settle a baby down, but I think a little time works as well as anything. His system is more mature, you are probably more comfortable as a mom, etc… Wait until he smiles for you, unless he already has. It so makes up for everything! I agree with Christine about time flying. We attended our little guy’s university graduation yesterday! Congrats on your son graduating from college – what a milestone! I love MSN. So glad they found you for a story. Working on it – he still is gassy but it’s much less and much more manageable. What a lovely little man! As the mother of four kids, I would say relax, and enjoy every minute, because if you blink, you’ll find yourself sitting at high school graduation! My little guy has strawberry blond her,too. Fennel tea is great, we in Germany swear by it. OMG. Is he really that blonde? That’s verging on the edge of fiery gold!! Beautiful! !